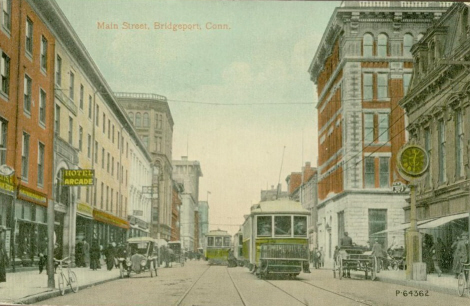 Main Street, Bridgeport, Connecticut, 1912. At least four forms of transportation are visible in this century-old postcard view. Every building in the photo, except for the four story "Hotel Arcade" and the two taller buildings in the far left background, have since been demolished, although most were still standing and in use as late as 1965. The streetcars of course are long gone, as is the clock. A tornado which blew through the downtown on June 24 of last year caused damage which resulted in the demolition of several of the remaining historic buildings. Still, a number of businesses carry on in the area, feeding off foot traffic from the nearby state and federal courthouses. Are you sure? A tornado in the East in 1910! If that happened today we would be told how rare that is and it must be global warming. so... What could have caused it in 1910? Beautiful picture! I actually suspect there's a fifth form of transit in some of those buildings: the elevator. Anyway, I hope you keep writing...I love the blog!